Our NEW Spring 2017 Newsletter is here! Read about the latest happenings around Sunbeam. In the newsletter you can read about the boys, hear from our Chairperson Kristy Beissler, Executive Director Sherry Bigalke, and Team Coordinator Mel Harmon. Also read about the rising of our social medias and hear updates from teams that have been at Sunbeam recently. Most importantly, you can read how YOU can help out Sunbeam and how to donate! We thank you all for your continued support of Sunbeam! I have so much enjoyed working and being in charge of Sunbeam’s social media, that I thought it was time to introduce myself. I am not one for the “spotlight” to be on me, but I enjoy sharing my Sunbeam story with all of you. My journey with Sunbeam started during my sophomore year in college at Winona State University. I always had my mind set on either studying abroad or doing a travel study sometime during my college career. I was in the middle of switching my major to Special Education then and I came across a 10-day travel study trip that the department had over spring break that was going to Jamaica. This travel study trip goal was to learn more about the educational systems in a different country and building relationships with the boys at Sunbeam. Wow, all I could say after my first trip was “when can I go back!” it may sound cliché but I came back a different person based on my experience. I not only grew as a person, I broke out of my comfort zone, created relationships with my team members and leaders, and gained a new perspective on life. I had been bitten by the “Sunbeam bug”. I wanted to stay involved with Sunbeam as much as possible, so I reached out to Mel. I attended the Sunbeam Celebrations, I talked at future travel study meetings about the impact this trip had on me and so on. But through all of this, I wanted more. In the summer of 2015, myself, two girls from my travel study trip and another college student traveled back down to Sunbeam for the second time. This time, I broke out of my comfort zone even more and decided to stay a month. I gained further connections with the both the boys and staff. I got to see more of Jamaica and be part of the Sunbeam family. I will hold that summer and the memories in my heart forever. Since that summer, I have remained involved with Sunbeam through many different ways. A friend and myself started a little business selling inspirational quote plaques to fundraise for Sunbeam and raised around $1,200. I helped design the celebration invites, Christmas ornaments, and take pictures. Most recently, I was elected to the SAM Board as one of the youngest members. I am currently the secretary and in charge of all social medias and the website. I also recently just came back from my third trip to Sunbeam! I made a spur of the moment decision and took a place on a team for a member that was no longer able to go. So good to get back to Sunbeam for a week! I always thought that the only way I could be part of Sunbeam was going there on trips. But I am so happy to continue my love for Sunbeam here in the states. If you would have asked me years ago if I would of saw myself continue to travel to Jamaica to a boys home, I would have said no way. But now, I wouldn’t have it any other way. Sunbeam and the people I have met along the way have truly changed me for the better. The memories I have made will last a lifetime. To just name a few of my favorite memories: having nightly dance parties with the boys when teams weren’t there, walking down to Gutter’s everyday with Kevel to get snacks and just walk around. Working in the Learning Center with the boys, attending youth group, spending time with the staff, and my favorite; going back to Sunbeam the three times and seeing certain boys grow up into young men. I could go on forever, but this post is already long enough. I truly want to thank all of you that support Sunbeam. If that is either here in the states or in Jamaica. Sunbeam is possible because of YOU! Thank you to the staff for all you do for the boys and thank you SAM Board for your ongoing dedication, thank you. Sunbeam Association for Mission is a 501(c)3, organized exclusively for charitable and religious purposes, specifically for the purpose of establishing and maintaining Sunbeam Boys Home in Jamaica to serve children and young adults in Jamaica; to provide a safe and nurturing environment; and to teach the principles of Christian living. Sunbeam Boys Home provides shelter, care, and an education to 40 boys, ages 7-18. We also maintain a transition program for young men 18+, providing support and encouragement and assistance with living and school expenses. Mission teams from America are a great asset to our program. Teams stay at Sunbeam, building relationships with the boys, sharing the love of Christ and doing physical labor as needed for upkeep of our facility. This is the week!!! 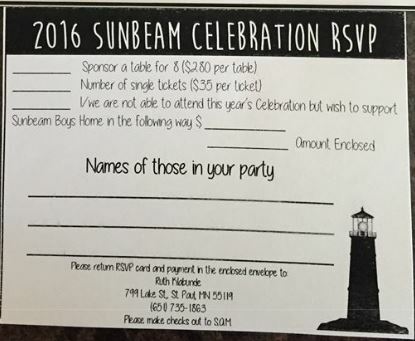 The Sunbeam Celebration is this Saturday, October 1st, 4pm-8pm at Oxlip Evangelical Free Church in Isanti. If you haven’t already done so, you should RSVP and join us! Many special things are planned for this evening with a lot of awesome auction items. We are pleased that Glendon, Dwayne, Omar, and Leroy, all past Sunbeam boys are able to join us on this special night! Let’s celebrate how God continues to use this special ministry!